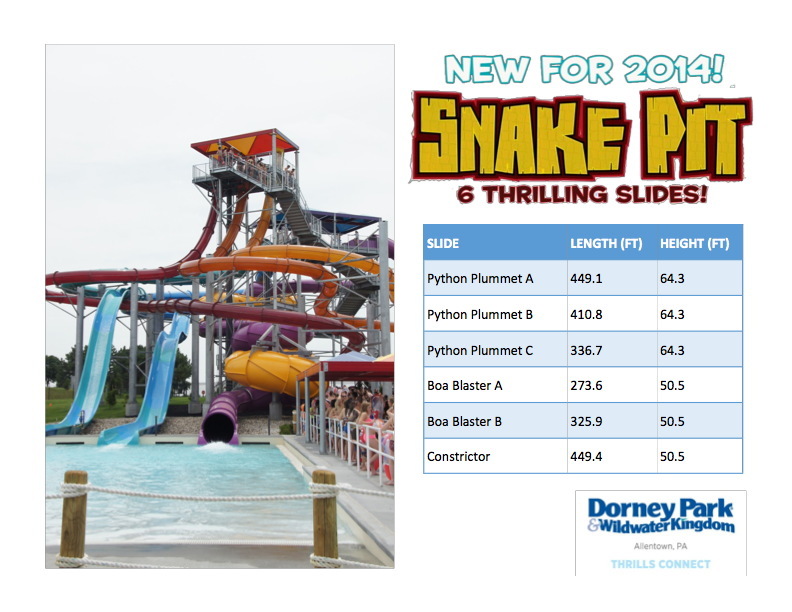 Slithering into Dorney Park's Wildwater Kingdom in 2014 will be the Snake Pit, a new WhiteWater West designed water slide tower containing six separate slides. 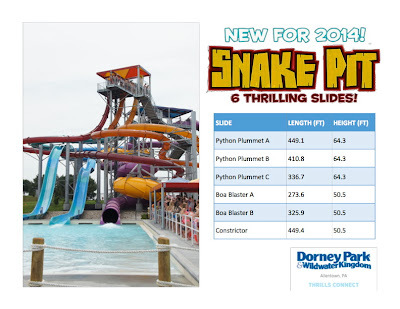 The news was announced today at the park, and consists of not only the new Snake Pit slide tower but also a host of other renovations at the water park. The overhaul of Wildwater Kingdom will be in celebration of its 30th anniversary, having first opened in 1985. When complete plans call for $8 million to be spent in 2014, with $4.5 of that on the new slide project and $3.5 going toward other renovations. Snake Pit's nearly seven story tall structure will go up on the hillside in the center of the park and replace the Riptide Run, which was an original attraction from the park when it first opened - the Lily Pads activity pool will also be removed. Additionally the ending of the Jumpin Jack Splash slides will be changed from a catch pool to individual run-out troughs. The new slide complex will have three different types of slides, Python Plummet, the Constrictor, and Boa Blasters, all providing thrilling experiences. As described by the park, "riders step into one of the three chambers of Python Plummet where, after an anxiety-filled countdown audible, a trap floor drops out launching Guests down a high-speed nearly vertical fall through a series of flat loops and s-curves. The longest free-fall drop slide takes riders on a nearly 450-foot long adrenaline rush. 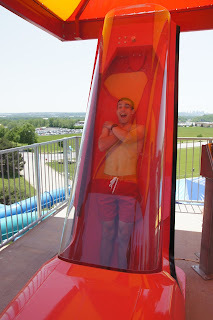 In addition to this intense experience, Guests can also choose between three different tube slides. The Constrictor spirals riders through an enclosed chute with four intense 360-degree loops across 449 feet of slide. Twin Boa Blasters shoot Guests down a series of high speed drops and banks as they hold on tight to a single or double tube." The park also released this concept art for Snake Pit, which shows that the slides will be in the same layout as the tower that was opened at Worlds of Fun's Oceans of Fun this past season. That complex received great reviews and was well received, so it is no surprise that it is being duplicated. Other renovations to the water park include additional seating, new changing rooms with electronic lockers, upgrades to the sound system, overall painting and more. It sounds like the park will be prettied up head to toe! 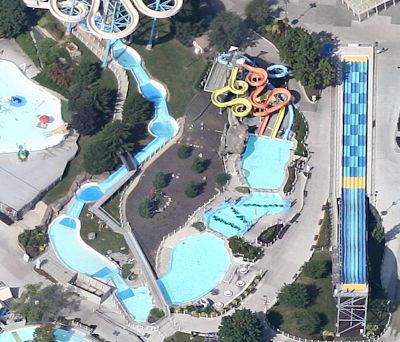 Just to give an idea of where the major work will take place, above is an aerial shot of Wildwater Kingdom. The series of pools the run from the top of the image toward to the left, down a hill to the bottom is Riptide Run, to be removed. Jumpin Jack Splash is the yellow, orange, and blue slide tower that will no longer empty into a pool. Below that is the Lily Pads and then the Oasis, an adult area pool. I would imagine that Snake Pit will take up most of this area, which was actually once home to another slide complex, the Torpedo Tubes. Dorney Park also announced this past weekend that All Wheel Sports, its popular extreme biking and sports show, held in the 600 seat Good Time Theatre, will return in 2014. The show had a very successful run in 2013 and often played to a full house. It sounds like next year will be another exciting one for the park!